Green in Manchester - Vanessa Hall: End Manchester to London flights now! 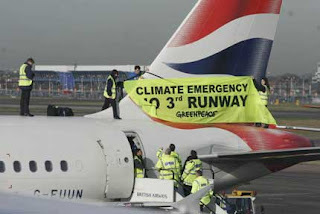 This morning, four of our volunteers have climbed on top of a plane at Heathrow and are wrapping a banner around the tailfin. The plane - one of 32 flights every day between London and Manchester - had just arrived in Heathrow and the passengers had disembarked when four volunteers walked through the double doors at Heathrow Terminal One, crossing an area of tarmac and climbing onto the fuselage of the British Airways flight. All the panel at the Great Aviation Debate in Manchester last November agreed that we should not fly between Manchester and London. That included the Manchester Airport paid "Professor of Sustainable Aviation", MA's Director of Planning, and the Chair of Greater Manchester Chamber of Commerce. The end of Manchester to London flights is inevitable, and the sooner the better.